﻿ Dammora Resort, Jeju Island | FROM $97 - SAVE ON AGODA! Have a question for Dammora Resort? 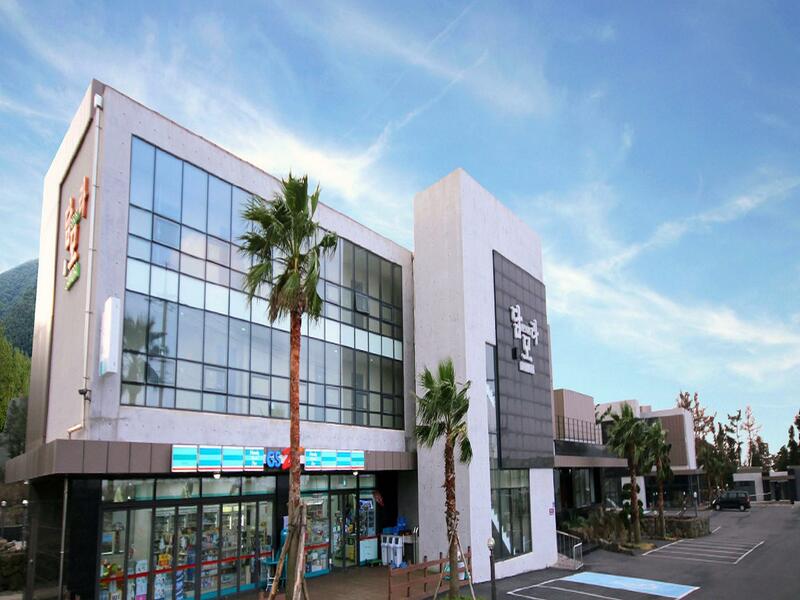 Built in 2014, Dammora Resort is a distinct addition to Jeju Island and a smart choice for travelers. The hotel lies 20 km from the city center and provides accessibility to important town facilities. With its convenient location, the hotel offers easy access to the city's must-see destinations. Offering hotel guests superior services and a broad range of amenities, Dammora Resort is committed to ensuring that your stay is as comfortable as possible. Top features of the hotel include free Wi-Fi in all rooms, convenience store, gift/souvenir shop, Wi-Fi in public areas, car park. The hotel features 60 beautifully appointed guest rooms, many of which include television LCD/plasma screen, internet access – wireless (complimentary), non smoking rooms, air conditioning, heating. Besides, the hotel's host of recreational offerings ensures you have plenty to do during your stay. Dammora Resort is your one-stop destination for quality hotel accommodations in Jeju Island. We stayed here on the first day of cycling through Jeju. The room was clean and spacious. And the staffs were so friendly and helpful. Just one thing that I didn’t like is that there are not so many restaurants at a walking distance so we had to eat light at the convenient store. But if you travel by car, it should’nt be a problem. 가족단위나 단체손님일시 좋을듯~ 저희는 마라도 방문위해 잠시 머문곳이라 정말 숙박만했어요. 비수기여서 그런지 여유롭게 잘 쉬다갑니다. 사장님 친절하시고 가성비 갑 이라고 생각됩니다. 번창하세요. 밑에 있는 편의점 완전 편해요!! 11월 말 온천이 여행코스에 있어서 근처숙소 알아보다 1박하게됐습니다. 방상태는 매우 깨끗하고 산방산탄산온천과도 매우 가까워 좋았습니다. 단점은 생수물병구비가아닌 복도에 정수기가있다는점 콘센트가있지만 침대 머릿맡에는 없어 조금 불편했습니다. 또 침대가 있지만 온돌이라 온풍기보다 건조하지 않다는 장점이 있지만 입실후 전원을 키게되어있어 몇시간동안은 추웠습니다. 비누와 수건은있지만 다른 소모품은 구비되어있지않습니다. 근데 단점을 생각안하셔도 될정도로 방이 정말 깨끗해서 기분좋게 머물다 갔습니다. 가성비 최고의 리조트입니다. 주변에 편의시설이 부족하긴 하나 가까운 중문, 서귀포에 갈 곳이 참 많습니다. 다시 제주도 간다면 또 이용할 것입니다. 회사에서 단체로 숙박하였습니다. 가성비 최고인 곳으로 잘 쉬다 왔습니다. 4년되었다고 하셨는데 기간에 비해 관리상태가 좋았습니다. 산방산 탄산온천 근처로 숙소를 알아보던 차에 담모라 리조트 예약했어요. 후기가 많지 않아서 살짝 고민했는데, 엄청 깨끗하고 방 세 개에 화장실 세 개에 넓은 거실의 위엄. 가성비 짱짱맨. 6명이서 묶었는데 너무 쾌적했어요. 10명 이상도 가능할 것 같아요. 리조트 앞에 편의점 있어서 편리하게 이용했고요. 다음 제주도 숙소도 담모라리조트 찜입니다. 조식걱정했는데, 생각보다 훨씬 맛납니다. 편의점도 있고, 객실도 넓고 편안하네요. 저렴하면서도 깔끔하고 좋은 숙소인거 같아요. 급하게 예약해서 기대안했는데 너무너무너무 만족입니다. 계획에도 없는 수영도하고 다음에 오면 무조건 여기 꼭 갑니다!!! !